We might have had a history devoid of top tier pro sports teams in this city since, well, forever. But how that changed when we were awarded the Golden Knights. Who would have thought a city in the middle of the hot desert would get there first team in the way of the pinnacle cold weather sport of hockey. The Golden Knights have taken the NHL, Vegas, and the world by storm. All of us here at the club, past allegiances or no, are die hard fans of this team and the inspiration they’ve brought to this city. 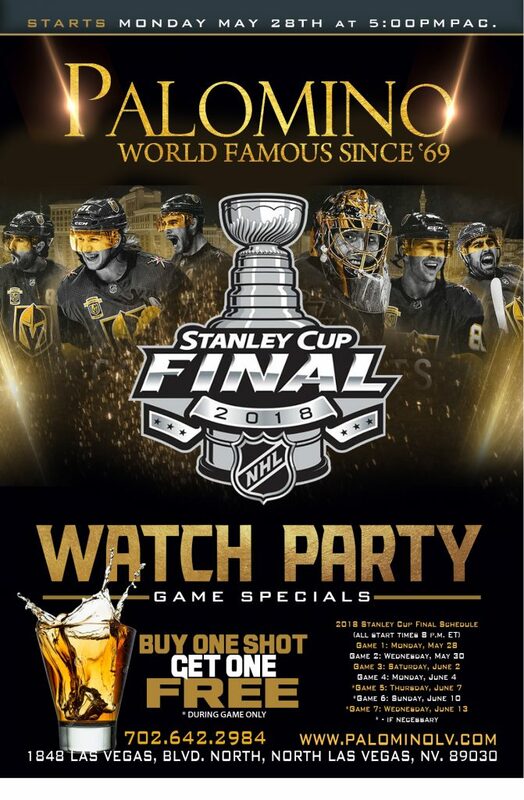 The World Famous Palomino club will be offering buy 1 get 1 free shots during the game during each Stanley Cup game. The entire season has been a celebration from the start, so its only fitting to end it with an even bigger one. Except if you do it at the Palomino Club, you can do it surrounded by some of the most beautiful totally naked women you’ll ever see.